Ideally situated on the cliff top overlooking Saltwick Bay, Whitby Holiday Park is perfectly located for exploring the nearby North Yorkshire National Park and stunning local beaches. The park is only minutes away from the quaint and historical harbour town of Whitby, with the world famous Whitby Abbey being right on your doorstep. In addition to the modern, high quality holiday homes available for hire, we also have luxurious and contemporary holiday homes available for you to buy. You will find the pretty, picturesque village of Hutton Le Hole on the southern edge of the North Yorkshire Moors, sheltered by the limestone hills. Hutton Le Hole was named in William the Conqueror's Domesday Book of 1085 as Hoton or Huton, and has also been named as Hoton Le Hegh and Hoton Underheg. In the 1600's the village was home to weavers and farm workers in a largely Quaker community with a reputation for fair dealing and honesty. Described by the Victorian's as "an ill-planned and untidy village..."Hutton's charm lies in its fascinating history, vibrant community, captivating attractions and idyllic location. You can discover what it was like to live hundreds of years ago by travelling back in time; you can take part in year-round activities and events. You can also eat a picnic on the green, enjoy a scrumptious pub lunch or afternoon tea and sample the finest fresh homemade chocolates. You can always walk the many footpaths and way marked trails taking in the beautiful Lingmoor, Lastingham's ancient church and Rosedale Abbey. 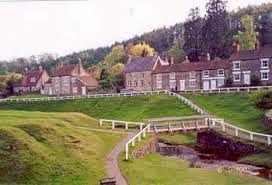 There is plenty to do in Hutton Le Hole to keep the whole family occupied. Pinfold: - As you leave the car park make sure you look to your right and you'll see the Pinfold which was once used to house stray animals. Owners had to pay a fine before they could reclaim their animals. The Old School House: - Replacing the first smaller village school built in 1845, this 'new' school was opened in 1875 at a cost of £500. It closed to pupils in 1972 and today it is the gift shop Merrils. Merrils: - Hugely popular in Medieval times, Merrils, or Nine Men's Morris is an ancient board game played by two people on a specially marked board with nine characters each. Why not look for the board hanging on the side of what used to be the Old School House. Up until the late 1990's, the Merrills World Championships were held in the Village. The Village Green: - Overseen by the Pinder, an official also responsible for impounding stray animals, the ancient and now rare court Leets protect manorial land that is "common" including village greens and and verges, as well as local residents who have "common rights". 100 years ago the green was grazed by poultry, donkeys, horses and sheep, while the Beck was used as an open sewer. Brookside: - Brookside was originally built in 1698 as a Quaker meeting house. In 1864 it was bought and repaired by the Hartas brothers who also blasted a little waterfall from the stream bed of the Beck. The explosion blew out many neighbours windows. Hammer and Hand House: - The unusual name of this hails from the arms of the Blacksmith's Company of London, which you will see carved above the front door. An earlier owner had a smithy attached to the adjacent building, now the Crown Inn, which was rebuilt in 1940. Ryedale Folk Museum: - Discover over 20 historic buildings from the Iron Age to the 1950's within the six acre site of this award wining museum. There's also a farming area, animals, fruit orchard and art gallery. St Chad's Church: - Early Christian missionary St Chad was Abbot of Lastingham Abbey in the 7th Century. The Church that was built and dedicated in 1934 was named in his honour by the Archbishop of York. The Oak alter is home to two famous residents carved by the Yorkshire artist Robert 'Mouseman' Thompson. So as you can see, Hutton Le Hole has much to offer all the family and as it is within an hour's drive of Whitby, it is the perfect place to go if you want to get away for the day!! Perched on a cliff-top, with magnificent views of the North Yorkshire coast, Whitby Holiday park is set amidst peaceful footpaths, golden beaches and beautiful countryside, with the charms of Whitby and Robin Hood's Bay nearby. National Trust owned Saltwick Bay and the Cleveland Way Coastal Path are both accessible direct from the park, making it the perfect retreat for walkers and nature lovers. © 2015 Whitby Holiday News. Phoebe Template designed by Georgia Lou Studios All rights reserved.